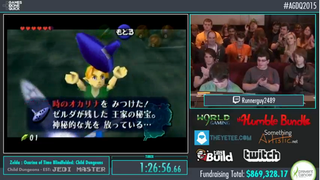 It’s the last day of Awesome Games Done Quick 2015, and to celebrate, speedrunner Runnerguy2489 played a few dungeons in The Legend of Zelda: Ocarina of Time. Also, he did it all blindfolded. Yep, he played through a solid chunk of the iconic N64 game without looking, finishing the first three dungeons thanks to some meticulous use of sound cues, glitches, and sheer memorization. The run lasts about an hour and a half, and it goes from Link’s house until he picks up the ocarina. Be warned: there’s a lot of jumping, menu-hopping, and trial-and-error as Runnerguy2489 bounces through the game. It’s also full of moments that are pretty goddamn incredible. For more blindfolded Zelda running, check out Runnerguy’s YouTube channel.